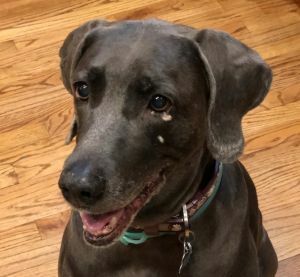 The senior Weims you see here are available for adoption. 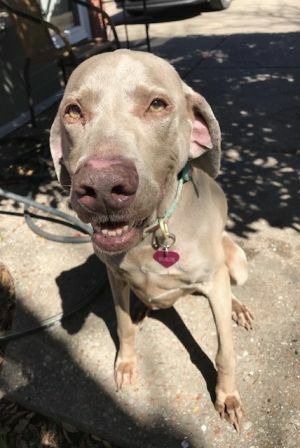 We share all of the information we have on the dogs, but it is common to have no background as the seniors come to us as strays or owner-surrenders to shelters where little data is gathered. We will tell you what we know and have discovered during their time with us. If you have unanswered questions about a particular senior, please let us know. See our Contact Us page for methods. Morty was found as a stray in Alabama, so we don't know much about him. He passed his temperament test at the shelter with flying colors and appears to be a big sweetie who is submissive with calm, friendly dogs. He is healthy, 80#, heart worm negative and neutered. He appears to have been well cared for at one time, so he's likely house trained but we cannot say for sure. Morty is willing to move and we have volunteers who will help. 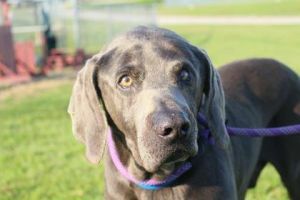 Please contact us ASAP if you are interested in fostering or adopting this big lug. SHOTGUN! Chloe LOVES to ride in the car. She's seeking a human to do the driving. Chloe is up for adoption and currently lives at a foster home in South Carolina. She is 12.5 years old, weighs about 80# and is up-to-date on vetting. In case you are wondering, her facial discoloration is from eye medicine she once used. She would be happiest as an only dog or with a calm, quiet sibling. She is used to living with a retired person and her foster Mom works from home. If someone is around your house a lot, Chloe's your girl! She also enjoys walks and boating (and likely long walks on the beach?). No dog parks though. We can arrange transportation within a day's drive of South Carolina if distance is an issue. If you'd like to be driving Miss Chloe, please contact us today.